Included among the nods is "Distinguished Performance of a Play," and "Distingquished Peformance of An Actor" for Jimmi Simpson (Farsworth) and Hank Azaria (Sarnoff). Nothing against Azaria, but we're rather pulling for Jimmi Simpson, who was positively riveting in the title role. The new Aaron Sorkin play The Farnsworth Invention, which explores the battle for the patent for the invention of television, will play its final performance at Broadway's Music Box Theatre March 2. According to Variety, Broadway box-office grosses slip this time every year, but apparently "The Farnsworth Invention's" box-office drop could be construed as more than just "seasonal." The seasonal slowdown on Broadway continued last week, with B.O. slipping by around $1.2 million to an estimated $14.3 million for 31 shows on the boards. Receipts dropped for nearly every production on the Rialto. In terms of percentages, the biggest dip was seen by "The Farnsworth Invention," down by 31% to $186,342, with "Chicago" ($245,076), "Avenue Q" ($233,723) and "The Phantom of the Opera" (dropping $120,000 to $475,303) all off about 20% each. Of course, over here at "fact -v- fiction" HQ, we might like to think that the loss of interest in Aaron Sorkin's play is directly attributable to it's factual failings, but I suspect there is probably more to it than that. Audiences no doubt forgive all kinds of historical transgressions so long as the play itself is adequately engaging. So there must be something missing besides historical accuracy. And BEFORE Moses, no less (#32). 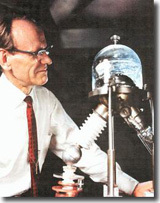 A "Second Life" for Farnsworth? Broadway's The Farnsworth Invention celebrated its best week yet at the Music Box Theatre. The new play by Aaron Sorkin grossed $346,739.00 for the week ending December 30, 2007. For those in the cast and crew, this is certainly good news. But, then, in light of the previous post... you do have to wonder. 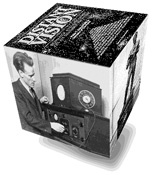 What brings Philo T. Farnsworth down, what causes him to lose out to the wily David Sarnoff, is that he believes that science should be done in the open. He’s stuck with a problem in implementing television, and he’s delighted to see a fellow engineer show up in San Francisco who wants to talk to him. But the engineer turns out to be an RCA employee who then returns to the East Coast and succeeds in transmitting a clear picture- something that Farnsworth had been unable to do. Now repeat after me: Farnsworth WON all his litigation against RCA, he retained all his patents, and RCA was ultimately forced to pay him no less than $1-million to use those patents. Three years later RCA snuck Zworykin's 1923 application through a lay court on some technicality in order to spend the next (now) seventy years making the case that results in misconceptions like this writer's -- aided and abetted by "historical drama" like The Farnsworth Invention. 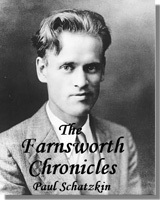 Farnsworth never explores any aspect of the story deeply. 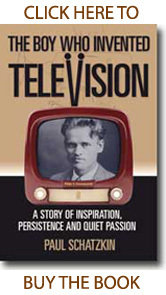 From the sources of the stirrings that made a rural potato-farmer's kid an electronics whiz by high-school age to the seismic shift in social patterns caused by the mass success of radio and then TV, everything is brushed in, snappily, with a factoid or two, encased in a wisecrack whenever possible, as on those TV docudramas that leave you wishing you'd been told the real story instead. Back on November 5th, I posted an entry here entitled "The Great Deception Continues" which cited a blog by Arthur S. Leonard, a professor at the New York Law School, who saw an early preview of The Farnsworth Invention as it prepared for its opening on Broadway. I noted then how Mr. Leonard had reiterated one of the fallacies of the play, i.e. Farnsworth's inability to deal effectively with his "light problem," and how that contention has always been one of the cornerstones of RCA's PR campaign to dismiss the breakthrough represented by Farnsworth's Image Dissector Tube. Schatzkin strove mightily to create the most accurate account he could, based on recollections of the inventor's widow and sons as well as many who had worked with him. To then see the oversimplifications, truncations, rearrangements of time and place, and so forth, that Sorkin undertook to create a dramatic vehicle of reasonable length, must be upsetting to any author. But perhaps more significantly, presumably for dramatic purposes, Sorkin's stage play distorts Farnsworth's life by suggesting outcomes that differ from the reality depicted in Mr. Schatzkin's biography -- not just in detail but in broad outline and theme as well. 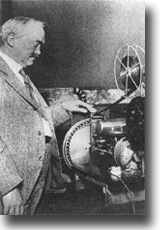 It would do well to remember that many of the important scientific inventions that created our modern world were devised by individuals who lacked extensive formal training in science and technology, who were largely self-taught, such as Thomas Edison, for example. It may be that true scientific genius would even be hampered by formal training, since formal training may have the unfortunate effect of grounding somebody too deeply in the received paradigms of his or her time ... for the truly unusual geniuses among us who are capable of the transcendent insights that produce the quantum leaps in science, higher education may at times prove a hindrance rather than an enabler of such breakthroughs. Now, why can't somebody put THAT into a play or movie?? The irony here is that it was my post of Mr. Leonard's post back in November that first tipped Aaron off to the fact of this biographer's (admittedly belated) reservations about his play. I may have had an opportunity to express these themes to Aaron Sorkin well before the play opened on Broadway. If I did I blew my chance. Now I don't know if Aaron and I are on speaking (well, e-mailing...) terms. So I just hope that whoever is monitoring this blog on Aaron's behalf will tell him about this post, and steer him toward Mr. Leonard's post. Perhaps then we will have something to talk about: "the spirit of exploration" (as Aaron put it in a couple of interviews).